Planting and cultivating a buffer of thick trees or bushes around a popular feeding area for deer can give animals a little more security to venture into the picture during daylight hours. 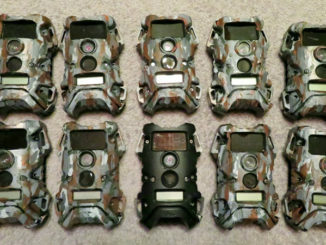 With long seasons in most southeastern states, deer hunters have an extended period to target trophy bucks, which makes consistent disturbance from hunting pressure and other factors a real issue. Hunters can improve their chances with a little buffering and protection around attractive sites on their properties, and winter is a perfect time to beef up buffers around ag fields or food plots to provide a better sense of security. 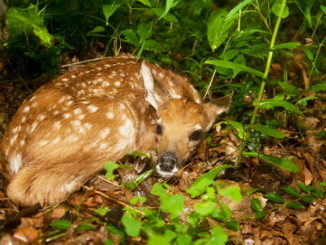 Care should be taken to shield these areas from unnecessary disturbance; that will promote their use by deer any time of day, when often, they are more likely to use them after dark. Many agriculture fields are located along highways, and many food plots are created from existing agriculture fields. While deer may become adapted to the constant traffic, a traveling motorist will frequently pull off to take a peek, flushing the deer back into the forest cover. Even when food plots are miles away from a public highway, they will frequently be created adjacent to a heavily-traveled woods road, which usually lacks significant cover to shield grazing wildlife from curious onlookers passing by. 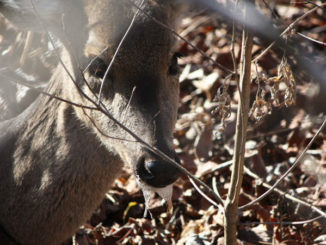 Security is the key to keep deer on food sources during daylight hours. Planting forested buffers along any travel corridors will significantly improve the productivity of food plots and prime agriculture fields during hunting season. The width of buffers should be directly related to the level of disturbance expected along the travel corridor. Highly traveled roadways need wider buffer strips than a small dirt road bordering a food plot deep in the wilds. Buffers should be at least 25 feet wide, but 75 to 125 feet is ideal to fully protect these animals from unnatural disturbances. The best buffers have a combination of trees, shrubs and brushy materials. The intent of any buffer is to provide 100-percent visual blockage and as much sound protection as possible. The preferred way to establish these buffers is from a combination of planting and volunteer recruitment. Unfortunately, buffer establishment can be a lengthy process. Tree plantings should be the start of these buffers, with volunteer shrub and brushy species following afterwards. Pines and other evergreen species susceptible to rapid growth should be selected to jump-start these buffers. Selecting evergreen trees also prevents any period of leaf fall compromising the buffer’s integrity as well. On most sites, loblolly pine is the choice for rapid height growth. On sites that feature particularly dry conditions, longleaf pines should replace loblolly plantings for a higher survival rate. Planting a combination of loblolly and shortleaf or Virginia pine will accelerate the coverage. While loblolly is known for growing tall quickly, the shortleaf and Virginia pine will have more lateral growth to cover the lower stratum. Loblolly pines should be planted a minimum of three to five rows deep. Trees should be spaced 6 to 8 feet apart along rows, and rows should be 10 feet apart. 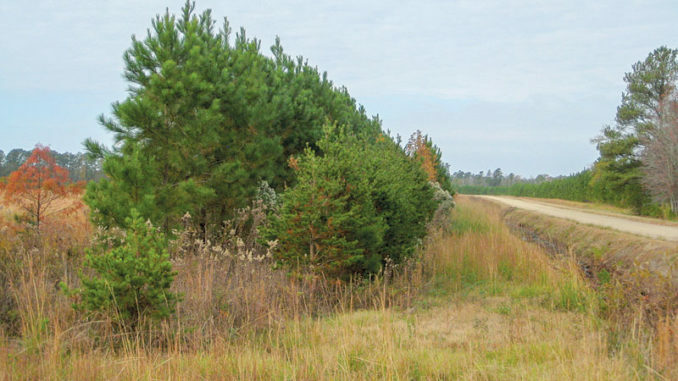 Shortleaf or Virginia pine should be planted along the roadway or in the interior of the buffer in their own rows, but in voids of the loblolly pine to complete buffer coverage. As the trees grow, other volunteer species will icontribute to the buffer. In addition to planting trees, shrubs such as wax myrtle can be planted to jump-start the lower stratum. While buffers can be created any time of year, all plantings in these buffers should be confined to the December-through-March period. To further encourage buffer growth, seasonal fertilization can be helpful. A balanced fertilizer of equal parts phosphate, nitrogen and potash can be broadcasted over the buffers in the spring and summer. This article first appeared on MS-Sportsman.com.